Oskar Laske was born on January 8, 1874 in Czernowitz (then part of the Austro-Hungarian Empire, and now in the Ukraine). Named after his father, an architect by profession, Oskar Laske the younger was expected to follow the same career track. He moved to Vienna at around age 13, and soon thereafter began taking art lessons from Anton Hlavacek, a Hungarian born painter who would be best remembered for his lyrically beautiful turn-of-the-century paintings of Vienna. At age 18, Laske began studying with Carl König at the Technische Hochschule, which was then one of the leading training grounds for modern architects and designers in central Europe. He remained there for six years before finally completing his studies at the Vienna Academy under the directorship of Otto Wagner. Upon graduating, Laske completed several commissions, one of which, the Apotheke zum weißen Engel (Apothecary of the White Angel), still stands in Vienna today. Executed in 1901-1902 in a graceful Jugendstil style, the building is most notable for its marble façade and the two angel mosaics that flank the entrance, a perfect encapsulation of Art Nouveau’s stylized beauty. Despite his architectural achievements, Laske soon turned his attention to fine art, publishing his first etching in 1904. He excelled as a graphic artist and saw his works published in the Vienna-based Zeitschrift für Vervielfältigende Kunst, one of the leading international fine art journals of the day. For the next fifteen years, print-making dominated Laske’s oeuvre, including a number of works inspired by his service in the First World War. Laske served as an officer in Galicia at the beginning of the war and was sent to the Isonzo front in May 1915. For the next few years, he worked as a military painter, describing in watercolors and prints numerous battles and operations in the Alps and in Eastern Europe. Laske’s non-war related artworks consisted mostly of landscapes, city squares and genre scenes, influenced by his travels in Europe and North Africa. 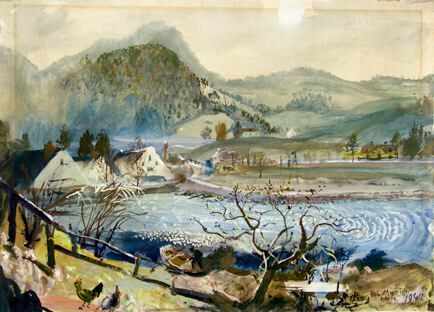 Hlavacek’s teachings are evident in Laske’s quiet and colorful vistas of the Salzkammergut. Laske also admired the work of Peter Bruegel and, especially, James Ensor (whose influence is distinctly apparent in Laske’s genre scenes). After 1919, Laske worked mainly in oil and watercolor. Though he did relatively few oil paintings, they count among some of his most arresting works.